The Fiji Islands Council of Trade Unions has accused the regime of double standards after it revoked FTUC's permit to hold a meeting to discuss the recent decrees. Both FICTU and FTUC jointly articulated the union movement's position to the ILO delegation last week and argued strongly that the decrees need to be withdrawn as they were targeted to wipe out unions altogether. "The recent Essential Industries Decree, the exclusion of public sector workers and their unions from the ERP coverage and the removal of check off are all very serious measures that need discussions which cannot be held without a meeting of the executives of any organisation. FTUC was trying to do just that, no more. Where was the need to revoke their permit for such an important meeting? Surely it would be in the regimes interest to ensure that everyone understood the decree," FICTU general secretary Attar Singh said. Singh said FTUC had applied for the permit in good time yet the letter revoking the permit was hand delivered on the day of the meeting at the venue. "This leaves no one in doubt about the regimes real intentions. It was not only preventing a meeting but also wanting to cause as much harm and inconvenience as possible to the FTUC, individual executives and the affiliated unions knowing that money would have been spent on making the meeting arrangements, travel and other costs," Attar Singh said. He said yet the regime allowed the Fiji Commerce and Employers Federation to have their meeting on the Friday to discuss the same decrees with their lawyers. "They were obviously given a permit, or were they?" Singh said FICTU also understands that the Boards and Committees of commercial company's meet regularly without permits even for their executive meetings. "Why such double standards one may ask. FICTU calls on the regime to allow all unions to hold their meetings freely. There can be no justifiable reason to prevent unions from meeting to discuss routine matters or measures initiated by the regime itself," Singh said. double standards big time. What can you expect from a bunch of hooligans running the country. Half of them dumb the other half, their use by date expired before the first world war. I suggest ILO commence the international trade ban NOW and shut the country down NOW. When everything in this country closes then lets see the fun. Murderer now PS for Works!!! Fiji's military strongman Voreqe Bainimarama has given a top public service job to his brother-in-law – a convicted killer. In a statement the Fiji Public Service Commission says the head of the Fiji Navy, Commander Francis Kean, has been named as acting permanent secretary for the Ministry of Works. He retains his command of the navy. Bainimarama seized power in a military coup in December 2006. A month later, Kean punched and killed a man at the wedding of one of Bainimarama's daughters, Ateca. Kean was arrested and tried before an Auckland justice sitting in the Fiji High Court, Gerard Winter, who convicted him of manslaughter. 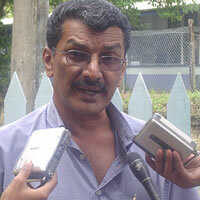 Winter noted that the reception at the Royal Suva Yacht Club a relative of the groom, John Whippy, was drunk. Several fights had taken place during the evening and at 2am Whippy left in a taxi. "As John Whippy was assisted to the taxi he was in an ugly drunken mood," Winter said. Kean told him to mind his language but as the taxi left Whippy kept yelling. Kean demanded the taxi stop. "(Commander Kean) then came up to John Whippy and punched him three times in the face," the judge said. "John Whippy first hit his head against the taxi light then fell heavily to the ground on his back. While he was lying on the ground Francis Kean kicked him on the chest. The accused was dragged away by an unidentified woman but returned to kick John Whippy's head." Winter found aggravating features in the case in that there was more than one punch and that the commander put the deceased down and then kicked him. "Kicking this man when he was down demonstrates to me that this was an attack of considerable ferocity. You lost your temper. You resorted to violence. You had to be dragged away from your victim." Shortly after sending the commander to jail for 18 months, Winter quit the Fiji High Court saying "I could not renew my warrant in 2008 if the military regime was still in power as to do so would run contrary to my original oath of office." Kean was kept on full pay while in jail but served only three months of his sentence. The Fiji Public Service Commission also announced another soldier, Lieutenant Tiale Vuiyasawa, would be head of protocol at the Ministry of Foreign Affairs. Ad Feedback It said Kean had ''leadership qualities and wide experience''. Kean is also chairman of the Suva Rugby Union. Earlier this year as the regime tried to take control of the Fiji Rugby Union by getting Kean named as its chairman. In the face of International Rugby Board disquiet, the job instead went to Land Force Commander Mosese Tikoitoga. Just have the meeting and dare the Regime to implement their draconian Decree ! Then sit back and watch opposition to the Regime grow experientially. To add salt to injury, and as a way of hitting back at the poor workers, these Illegal GOONS, through Arse and Miss -know-it -all PS Powell are withholding the payment of BONUSES to statutory bodies. Some of the bonuses now long over due are CONTRACTUAL, whilst the rest are 'performance based'[PMS]. They were very efficient and fast in approving pay rises to the military [non-income generating], but they have been dragging their feet in approving BONUS payments to income generating bodies!!!! Powell, we who are affected would like a CLOSURE to this whole BLOODY issue!!! Either approve or disapprove the payments!! Period!!!! We would like to put a closure to this and get on with our miserable lives!! Stop playing games and playing the 'high and mighty' game with us. It has rubbed off on too many people already. Grab the bull [Arse/Vore] by the balls and close it off Powell!!!! Ms Powell - you are starting to be a mirror image of that Sharon, what's her name. Power sure corrupts!! Dua e kai valagi, dua e kai loma - drau yavu sega na nomudrau yavu!!!! Let me put it another way Powell - the total bonus payments will surely generate more income to your cash-strapped government by way of taxes. Can you not see that/ I guess you can't. Another thing, it is very obvious that your Vore is TRYING to win the hearts and and minds of the local populace, who are NOT as stupid as you people think they are. Implementing the the promises made by Vore is a different issue altogether. If the 'operators' on the ground are NOT happy then the deliverance of the promise is another issue that you will have to deal with. In short, what I am telling you is this - Give them their dues and they will deliver. U Coprehendo?? Simple stupid. There are more ways than one to skinning a cat like your ancestors used to say]!!!! You may want to consider stepping up on your personal security. Remember - 'to be forewarned is to be forearmed". TIME FOR UNION TO BE UNITED AND KILL THE ILLEGAL GOVT. THAN THE GOVT WILL FALL. Good job, guru. Please carry on. Problem is UNION leaders already have blood on their hands-whose to believe them now?? @annon 3.44pm...You`re another confused Fijian,surely you can`t be serious.Trade Union leaders are not murderers,they`re freedom fighters who stand for the oppressed,the workers who don`t have a voice,the ordinary man and woman who is being exploited in the job market.Remember the saying you find on posters in some work places?...`THE BOSS IS ALWAYS RIGHT`..well in the disciplined forces ..maybe, yes, but surely there are instances where you need to be represented..court martial ..etc.T/U leaders do just that on behalf of the ordinary worker.Anyway if there`s truth in your allegation... let trade union leader who`s killed somebody be put on trial and be sentenced accordingly.